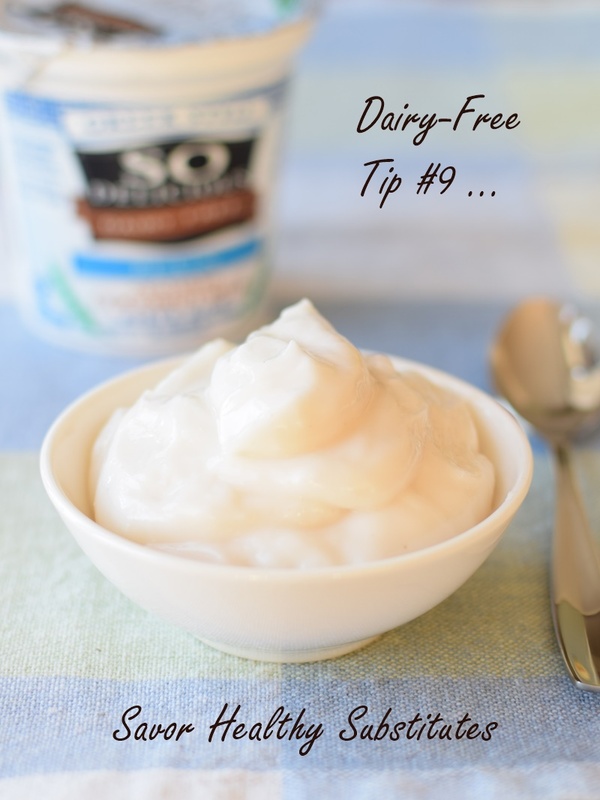 In honor of the 21-Day Dairy-Free Challenge, I was invited by So Delicious to share my top dairy-free tips. 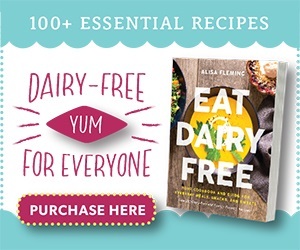 The advice below is intended to help you on your journey with useful facts and appetizing ideas for living dairy-free. Milk is a confusing and sneaky food. It lingers on labels under names like caseinate and whey. Yet ingredients like caramel color and cocoa butter are typically dairy-free! See and print my Dairy Ingredient List for instant label decoding help. The downfall of a change in diet is often hunger. If your stomach is rumbling and there aren’t any good options in plain view, the temptation to grab something old and familiar can easily win out. Keep an assortment of fresh fruit, trail mix (with nuts and seeds), homemade granola bars, dairy-free chocolate coconut milk beverage (yum! ), cut vegetables with dip, healthy cookie bars, and nutritious vegan chips or crackers. 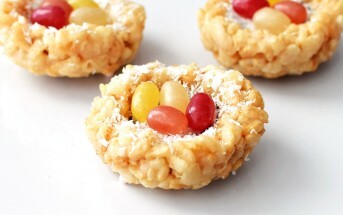 See this post for more ideas: 10 Good Healthy Snacks for Sweet Cravings. Did you know that under federal labeling laws, a product can be labeled as “non-dairy” as long as it contains less than .5% milk protein by weight. Though “dairy-free” is not a regulated term, most food producers unofficially use this phrase to represent products that are actually milk-free. For example, most brands of non-dairy creamer contain some dairy, but this entire line of dairy-free creamers is made without a drop. And while we’re on the topic of milk’s sneakiness. Even store-bought bread, chips, and deli meat aren’t immune to a dairy invasion. On the flip side, some creamy foods that might seem dairy-rich are almost always milk-free, like mayonnaise (vegan or regular) or coconut milk. And yes, there ARE numerous brands of real dairy-free chocolate. Just like any food, if you continue to eat it in any way shape or form, you will most likely continue to crave it. If your goal is to go dairy-free, then cheating could easily derail your efforts. Of all dairy foods, cheese seems to have the most common addiction cycle. Just something to be aware of! A true blessing in disguise, most restaurant desserts are not dairy-free. This has probably saved me more than a few unwanted pounds, but sometimes my cravings don’t subside after viewing those enticing post-meal menus. For those predicaments, I keep rich, creamy dairy-free ice cream on hand (I love the almond-based ones, my family loves this cookie dough flavor)and have mastered a few quick dairy-free dessert recipes, like 5-Minute Mint Chip Vegan Mug Brownie Sundae and Raspberry-Infused Chocolate Pudding. Host the parties, pick the restaurant to meet up at, and suggest a walk in the park rather than meeting for ice cream. Most friends will appreciate not having to host, you making the decisions, or getting some exercise rather than inhaling unnecessary calories. When you host, you control the food. When you pick the restaurant, you can review the menus, ask questions in advance, and select the best option for you. When you skip the food meet-up, you have more time to focus on the friendship while getting your body moving! Milk is just one food. Sure, our society has whipped it into a myriad of applications, but there are thousands of other foods, ripe for the picking. Add new seasonings to your spice cabinet; trial different grains; experiment with fruits, vegetables, nuts and seeds; and think globally. Cuisines of Asia, for example, (such as Japanese, Thai, Chinese and Vietnamese) are nearly dairy-free, naturally. These days, there is at least one substitute for just about every type of dairy on the market. I adore cashew milk with granola and in smoothies, coconut milk beverage for cooking and baking, rich coconut milk for a cream substitute (yes, it whips! 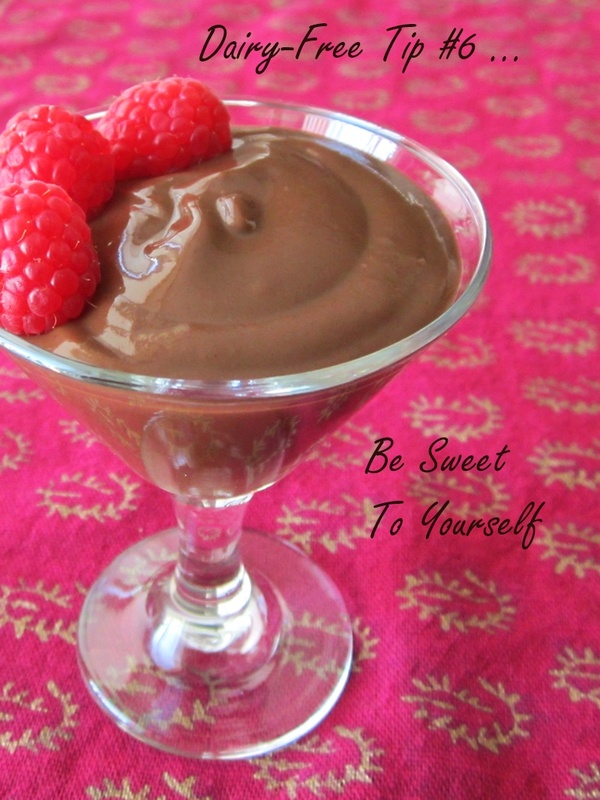 ), and almond milk ice cream or Greek-style coconut yogurt for a light treat. My husband loves coconut milk creamer in his morning coffee (no sweetener required!). If you must, there are even substitutes for sour cream and all types of cheese – just be aware that they are not identical to their dairy counterparts. Enjoy favorites that are naturally or easily dairy-free for a seamless transition. Examples include stir-fries, spaghetti, peanut butter sandwiches, fried rice, burgers (meat or veggie), fajitas, grilled skewers, your favorite protein with roasted vegetables, and chili. For more ideas, see my post for 5 Easy Dairy-Free Meals and the recipe links in dairy-free tip #11. A nutritious diet without dairy is more than feasible. In fact, enormous healthy populations around the world are dairy-free. But since our society tends to use dairy as a primary nutrient source, make sure your dairy-free diet and lifestyle is well-rounded with Vitamin D, B12, calcium, magnesium, and protein. Some dairy-free milks step in to provide all of the above! 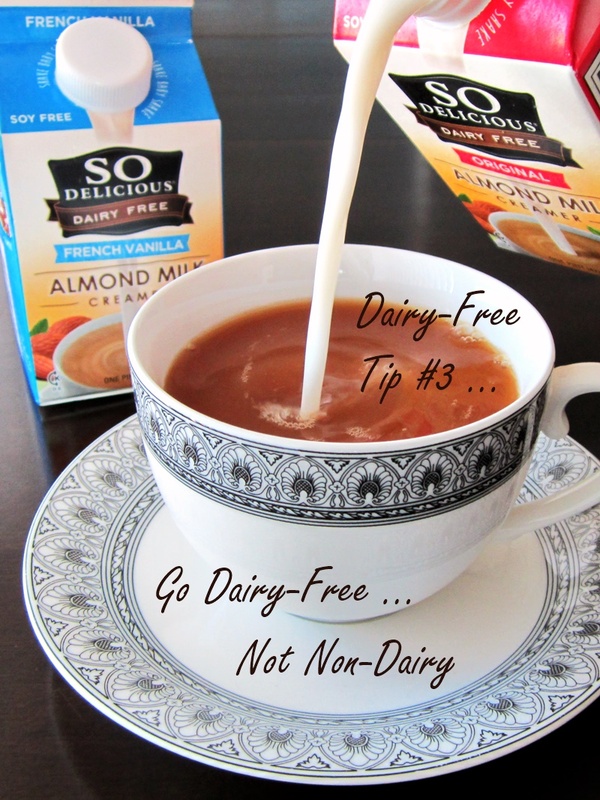 What are some of your favorite dairy-free tips? Please do share for others in the comments! This post was sponsored by So Delicious Dairy Free and the 21-Day Dairy-Free Challenge. But the dairy-free tips provided are my own, and I purchase (with my own cash) and recommend all products mentioned and linked to! I am G.F and Dairy free at age 76 having suffered most of my adult life with every test imaginable until 3 years ago when I found out the true mystery of my illnesses. Is it easy no, but worth it. 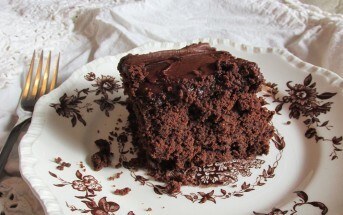 I, too, get flack for my “diet”…nee how do you know….are you sure? My reply “do you think I would do this out of a whim? No. ” But I feel so much better! It is more expensive and time consuming to change you whole life pattern but finally I have some relief from the misery of my illness. Eating out is difficult, so we for the most part always cook in or have guest over to try out our recipes. My husband is supportive and has seen how ill I have gotten over the years. I love this website and use it and the cookbooks daily. Thank you so much. Hi Janet, thank you for sharing your story. It is so inspiring! I agree, good health is worth it, and I’m so glad you’ve found a resolution to your illnesses. I’ve only recently eliminated dairy but had to go gluten free a decade ago. My suggestions from that experience are proving to be quite similar for eliminating dairy. Go cold turkey and don’t immediately try to find substitutions. When you’re used to what a certain food tastes like, the ‘sub’ is unlikely to satisfy you because you’ve been eating the real thing for years. When I had to eliminate gluten, I focused on veggies, proteins, and starches that were naturally gluten free. Over time, I began to experiment with adding in substitutions. By that point, my taste buds had changed and I think I was mentally more open to something that tasted different. Applying that to the dairy free change, I have always loved sour cream and cheese. Dairy free sour cream and dairy free cheese do not even moderately resemble their dairy counterparts. Rather than having a super negative reaction of, ugh, I miss sour cream and cheese even more!! !, I’m trying to just not substitute for it. Yesterday I had nachos without queso but found they were actually quite good with the refried beans, guac (the creaminess helped with the missing sour cream), and a ton of salsa. Did they taste like my favorite/usual nachos? Absolutely not but I found that I did enjoy them and now I feel like I can eat Tex Mex out and be satisfied. 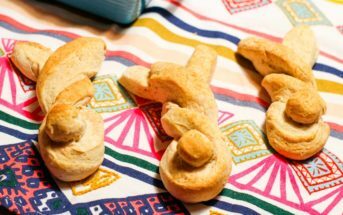 Maybe in a few years I won’t loathe the taste of nutritional yeast – ha! I apologize if it’s in this article and I’ve missed it but I’ve looked twice and am not seeing it. Several people have mentioned cashew cream as one of their favorites…what is this? Do you buy it or make it? Thanks! I am a 57 yr old who has such a hard time getting people to understand that children are not the only ones allergic to cows milk. Waiters think you are on a diet. Friends and family are not much better. I had problems as a child and it came back a few yrs ago after a illness. There are not many places for adults to turn to. Yes it is a true allergy I carry a Epipen. Your Website has been a big help. Oh Theresa, I feel your pain! I’m so glad I can be here to help out at least! Well, you’re certainly not alone Diane! Tons of us have milk allergy, and not just lactose intolerance, but it just isn’t readily recognized. Just learned last week, after eight months of illness, that I am lactose intolerant. Now, instant cold-turkey to a milk-free world for me at age 55. Thanks so much for these tips and for the advice of all the others who have commented. I’m so thankful to have found your website!! 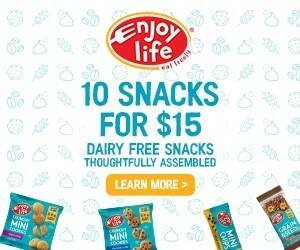 My 14 month old daughter was just diagnosed with a milk allergy and I’m just starting to navigate these waters…which is not so easy with a 2 1/2 year old in the house who loves dairy and is learning with us what foods his little sister can’t eat! Coming up with meals and snacks that we ALL want to eat (so that I’m not cooking multiple dinners every night) is challenging. These resources and ideas are SO helpful. Thank you. Thank you for the tips. My 13 year old daughter is severely allergic to milk and this advice will help us as parents support her diet as well as improve our own! So glad I can help and good luck to all of you!! Thanks so much for these tips. I didn’t think I could do anything besides get the extremely expensive formula for my daughter. I am hoping if I go dairy free my daughter can continue nursing with no problems! Glad I can help Tabitha! Ever since I found out about the movie “Got the Facts on Milk” from your site (which I’m sure anyone reading this would like) I’ve been trying to make the transition. Some great tips on here – after discovering almond milk ice cream I’m feeling a lot better about my decision! That’s great SC, thanks for sharing! Yes, indeed, that almond milk ice cream is good! Such good advice! Thanks for putting this list together. Will be sharing this all over the place! I am with my friends who recommend high speed blenders and cashews 🙂 I recently introduced my mom (who eats dairy) to cashew cream in her coffee and she was hooked! Such a helpful post, Alisa. Absolutely important to eliminate dairy completely, rather than phasing it out. It’s so addictive, and unless it’s out of the diet altogether, hard to be successful removing it. This will be a useful resource for so many – going to share up! Thanks Hallie! Great tip. 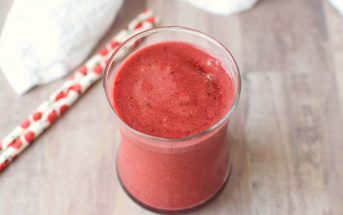 A blender is indeed awesome for those creamy desires! these are all excellent tips, Alisa! my biggest tips? Seek help, guidance, support. Research expert advice (like your blog! ), find people who are dairy free, let those close to you know this is your plan. another tip – Focus on what you CAN eat rather than what you must avoid – there is a big world out there full of vibrant foods that are naturally dairy free! Thank you so much for hitting on the “support network” concept Kristina. This is very important, too! I wouldn’t go high fat with a lot of the dairy substitutes (fake cheese, cream cheese, coconut cream, etc) but maybe you need a transition stage. For breakfast cereal I make ‘banana milk’ now – just blend 1 fairly ripe banana with 1-2 cups of water for your morning breakfast cereal. So creamy and tasty! I used to make almond milk but that is more of a production – this is fresh every morning! Check out Dr. McDougall’s chapter The Fat Vegan – too many people go vegan and eat tons of vegan desserts which pack on the pounds due to all the fat! For those seeking low fat, banana milk is a great option. Thanks for sharing this! Great tips Alisa! I particularly like the one about keeping snacks around, I suggest that for people who are going gluten-free too. I think Cashew Cream deserves its own category 🙂 If you go dairy-free you must try making cashew cream. It is a staple in our dairy-free home. Researching the dairy industry might change your mind too. The treatment of cows on industrial farms is horrific. Indeed – cashew cream is a staple in our house, too!